CG424: $5 off any purchase of $9.97 or more. Mother’s Day is May 13th. What better way to show Mom that you care than with a shirt or accessory customized just for her? Offer ends 4/30/12, 11:59 PM EST. CG410: $5 Off Your Purchase of $9.97 or More! Are you participating in a charity run/walk event this spring? Are you doing a mud run full of obstacles? This is great chance to get a custom t-shirt, performance shirt, or accessory for your event! Offer ends 4/16/12, 11:59 PM EST. Think homophobia is so gay? Tell the world with this custom t-shirt! This is the perfect item to wear to a gay pride festival, parade, or rally. Also, don’t forget to check out the other gay pride shirts we offer at CustomizedGirl.com! You’ll find designs supporting gay marriage, equal rights, or just to announce your relationship status. Any of our designs can be customized with your own names, colors, or message using our design center. Simply start with one of our pre-made designs or upload your own! 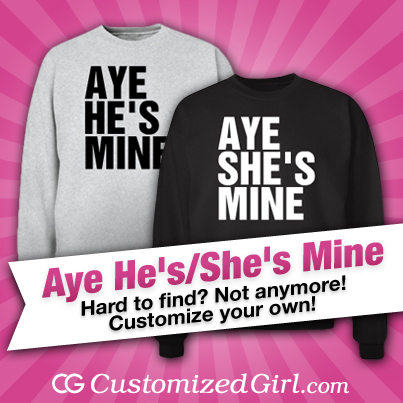 Custom Aye He’s Mine Sweatshirts, Pinnies and MORE! Ah yes, the elusive Aye He’s Mine sweatshirt. Trouble finding it, huh? You’ve seen it all over tumblr and YET don’t know where to get it. You can find the design on our site! What’s better, you can take that design, like all our designs, and put it on another item, like a cool pinnie or tank top. Hold up, I’m not done yet. You can also customize the design itself by changing the text, font, colors, add art and even upload images. So, not only can you design your own Aye He’s Mine or Aye She’s Mine apparel and gifts, you can even design other hard-to-find text tees you fall in love with. As long as the design isn’t trademarked by a corporate fat cat, have at it. Be your own designer and create cool stuff your friends won’t have (and will prob steal from you). Yeah it’s pretty cool–the designing, not stealing. Ok, NOW I’m done. Get customizing!